"gardeners could feel empowered by their contribution of labor and rewarded by the produce grown." I believe people are the power for any change. I want to be the change too. The Dervae family of 4 who work together and plant sooooo much in edibles on their small property, it is absolutely INSPIRING! Please watch this 15 minute Award Winning Short Film. I can't embed their other film on youtube but please also watch "The Dervaes family Garden". These people are my hero's because they grow literally! over 6000 lbs of foods on one tenth of an acre! Yes you read that right.....if there is any wise use of land, it is this. I Aspire to this. I want to do something right, something good, not just for myself but for others, at least those near to me. I want to be an expression of love, and in my world, that expression means Beauty and Bounty, virtues which extend not just with me, but into what I do with the land I live on. This land is here to give me (us) nourishment and beauty and life and care for my soul....this is the Mother's Love.....I want to be a human extension of Her love........and so I'm a gardener.....With Her. In my quest to leave a Legend of Beauty as my Legacy while I live, and when I'm gone, everywhere I find myself living, I plant gardens. On this particular property it happens my housemate also likes gardening and though I do 90% of the work and plantings and he is allowing, open and does some fix-up things I cannot do. It must be working because people knock on our door to either compliment or offer to sell the property that week! It is far from an estate house, but a cozy Hobbit Cottage....and this has been told to us by others too. It is a canvas for me to paint a beautiful landscape in which I and others can enter my own creation!, enter the garden myself, and smell the scents, eat what grows and touch the softest petals of flowers that bloom, find joy in the butterflies that flutterby, and red dragonflies who greet me every time I walk outside, birds who are no longer shy and walk next to us and even land on my housemates legs, animals who find shelter, and a sparkle in the air when the Mother is healthy and in joy of our efforts with Her. There is sooooo much we can do and I want to do it all. I want to not only garden I want to cultivate delight......grow Beauty........nurture Joy.....and sleep with whimsy. So I garden, both in the soil, and in my own mind. On this property there is much to do, now that I have claimed this house I've lived in for 10 years now, a "home", with the blessings of my housemate. I have done much already, a bit of which is expressed throughout this blog. Right now, however, I'm looking to make the space of this property useful especially the space the grass takes up otherwise known as "lawn"....a term which is banal to me. Grass is here only to tell us humans "here is the space in which you can grow edibles to feed you or flowers to delight you, and if you choose not to, then it is the indispensable ingredient to recycle that which has not been used or that which is left from what has been used.....grass is the necessary ingredient for your compost, which returns, recycles that which I have given you back to its origins, so I may begin again, and continue to give to you and your children". 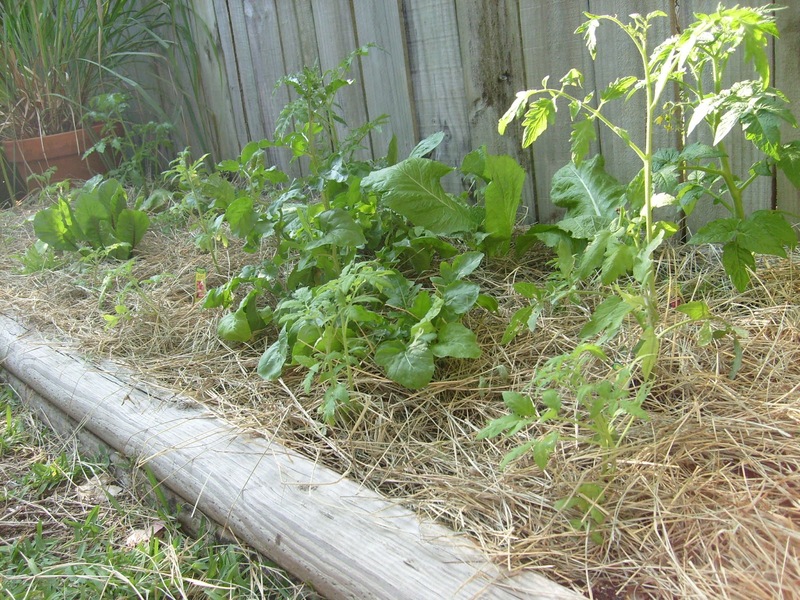 The compost is actually one of my most favorite aspects of gardening for it takes what is ignorantly called "garbage" and alchemically turns it into the richest, most alive black soil nutrient one can imagine. I don't understand people who do not compost. That kind of ignorance or neglect is beyond my scope of understanding. So, I have plans for the space here where the grass is growing, but right now it is indispensable to my compost for it makes Black Gold (soil) from my vegetal waste, for luscious, delectable, rejuvenating, beauty promoting foods. A person's health and appearance is testament to the wisdom they live or don't live. I want to be, at the very least, wise and beautiful. 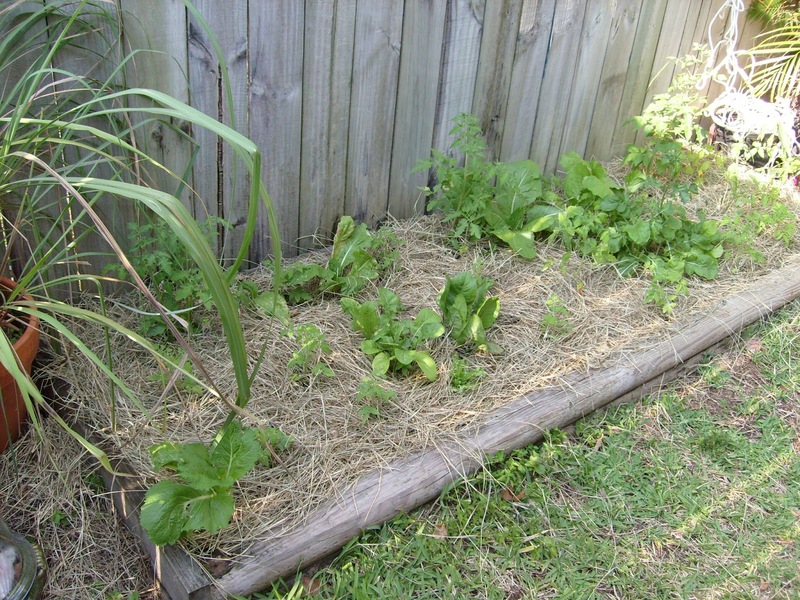 Though one practical reason I've learned is the magical ingredient.....STRAW or HAY. Soil, or the Mother's skin does NOT like to be exposed. 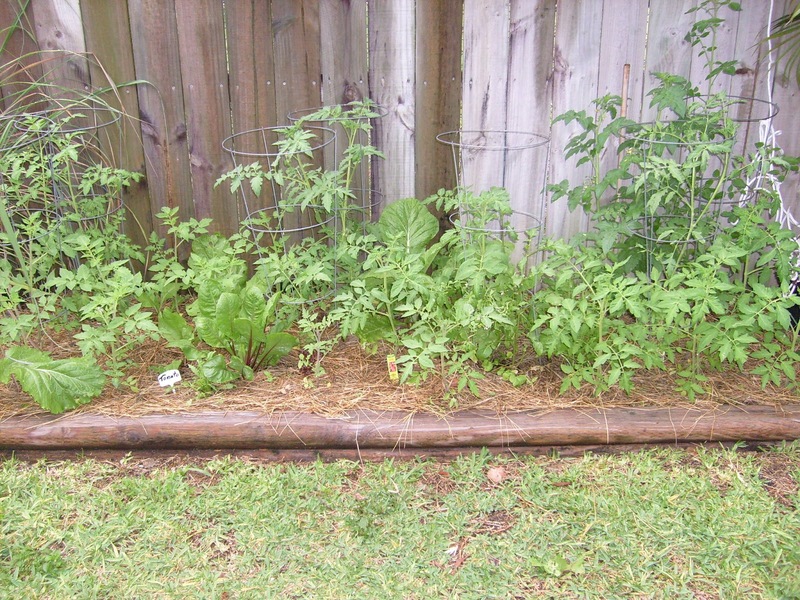 It is why weeds grow over soil where humans have failed to garden.....the skin/soil must remain covered so the life promoting organisms known as microbes and insects can do their work, in moist and dark soil, undercover, and keep the soil alive. The soil or skin also must remain covered so as to remain moist and not dry out. I learned this in the most difficult of ways. Now that I keep all of her soil covered, things grow! I am going to make a post about straw soon this in my series "In Awe of Mother Nature". 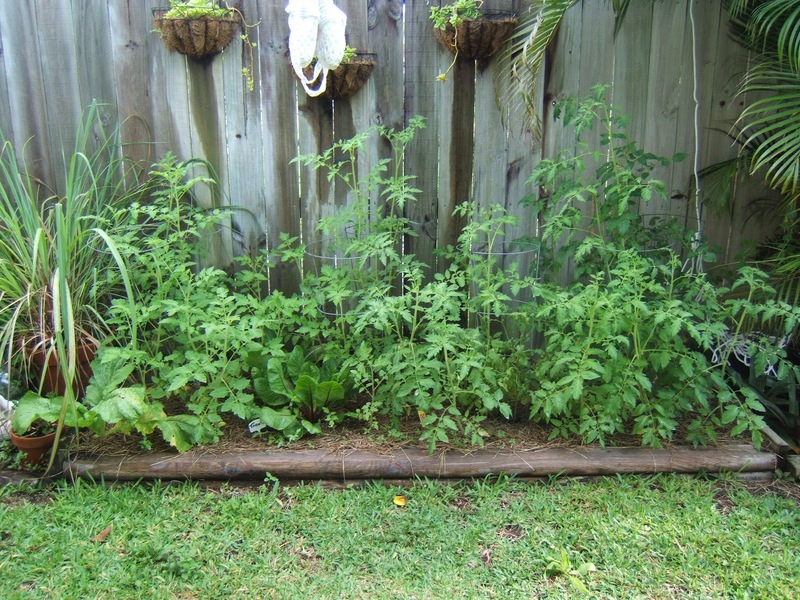 So here are pictures of that tomato bed which is fast becoming the Wall! This is an 8 ft by 3 ft patch. Week one. 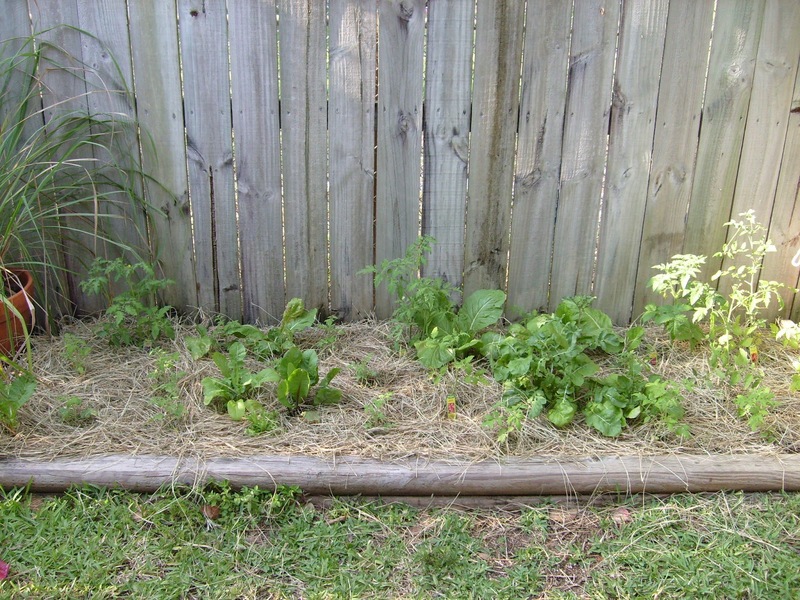 Around 21 small plants were planted between the mustard and arugula greens which are the large leafed ones. You can barely see them, right? There are a few larger ones too. Week 2. They have grown 4 times their original size in 6 days already needing cages. For me, this is huge growth. Week 3. They have doubled again in size. Many flowers on them, and around a dozen baby tomatoes so far. 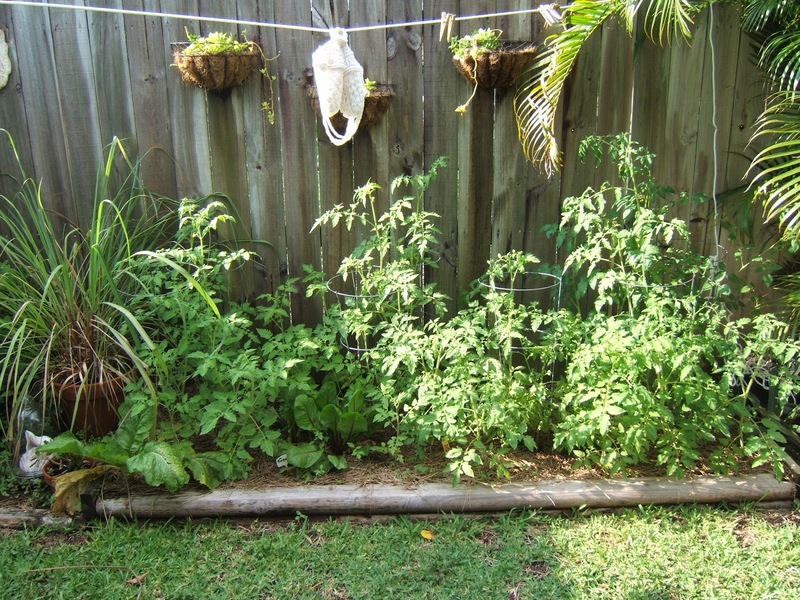 My Toy Box Garden......has a dozen tomatoes growing, the most I've seen ever growing on one plant. 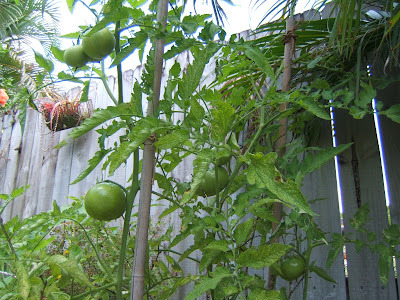 Even on a dozen different plants I never had a dozen tomatoes all together! Bountiful Blessings to you and yours. I love Victory Garden and have always enjoyed catching it. The old on and the new one. Thanks for stopping by. I'll follow you too. Oh my goodness.....I think your hands ONLY HAVE GREEN THUMBS..no fingers here.......just thumbs. Your garden is fabulous. LOL, Jo I used to have only green thumbs, then the unthinkable happened and I couldn't figure out what it was, but I think sheer will, and sheer love, is making everything green and lush again. good for you! 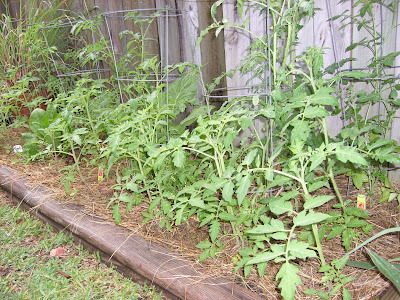 gardening is so fun for me too...I enjoy everything about it! I gave my son some radish seeds to plant, knowing they would be ready when his semester was over and he would see them growing...and be forever hooked too!! That is so great!! I have been a gardener for over 25 years now and I always love to see others get excited about planting....I see so many people around me who have ACRES of land and do absolutely nothing with it...not even a small garden...Enjoy those tomatoes...They look beautiful!! Hello There! I do agree - gardening is wonderful and to me should also be delightful! 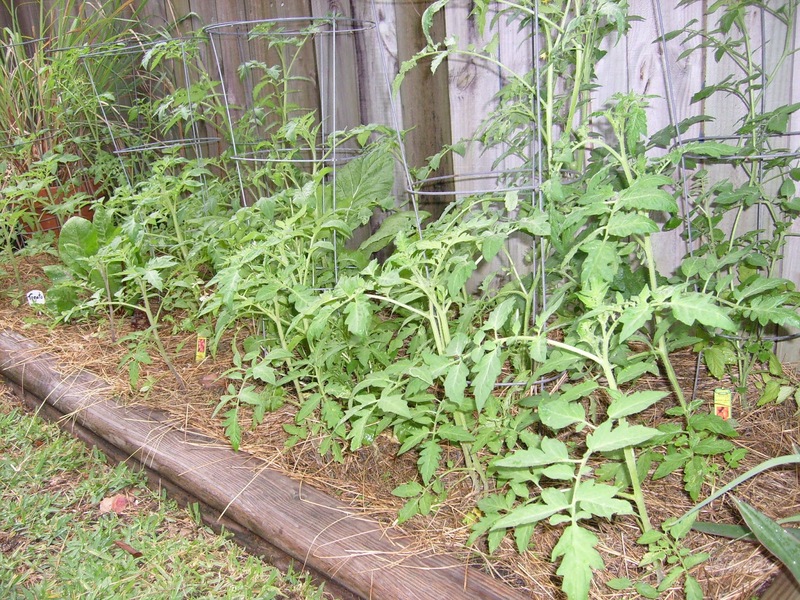 There's nothing better than home-grown produce!